Barton End was built in the early 1880s as a private house. Its grounds once extended to the recreation ground to the south, and it was for many years an old people’s home. 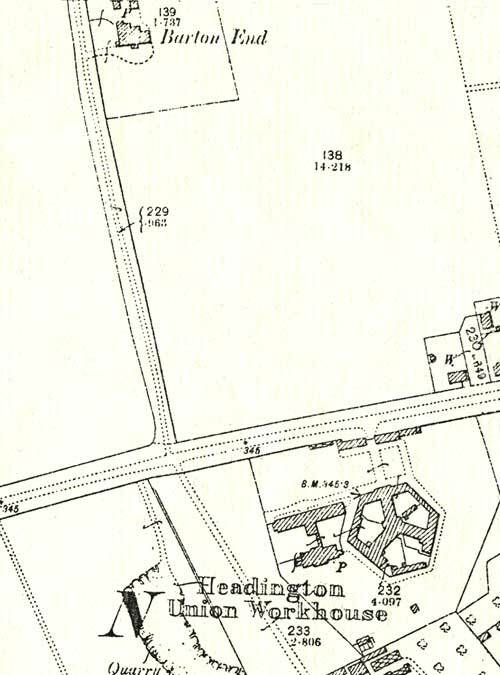 The Ordnance Survey map of Headington in 1898 (right) shows that at the end of the nineteenth century Barton End was still the only building in Barton Road. There was, of course, no bypass then, so that Barton Road and Barton Lane both passed through open countryside to meet at the south end of Barton Village Road. Barton Road was not developed until the late 1920s, when Oxford’s first council houses were built here. William Orchard, the master mason responsible for much of Magdalen College’s building work in the fifteenth century, lived in Magdalen property at Barton that was described as “a lyttel house with an orchard called the Pale and three acres of land”. This is believed to have stood on the site of the present Barton End. As the map on the right shows, before the London Road was built in the late eighteenth century, the path that is now Barton Road continued straight on down to Quarry. Barton End was built by Major-General Arthur Harness and his sister Caroline Mary Harness, the unmarried son and daughter of Sir Henry Drury Harness. Sir Henry had retired in October 1878, and the plan was that Caroline (known as “Coe”) would live at Barton End with him; but unfortunately he died suddenly at the house on 10 February 1883, and was buried in St Andrew’s churchyard four days later. Caroline instead went to live with her brother Arthur at Woolwich, where he was Captain of the Cadet Company at the Royal Military Academy, and thereafter they let Barton End out to tenants. 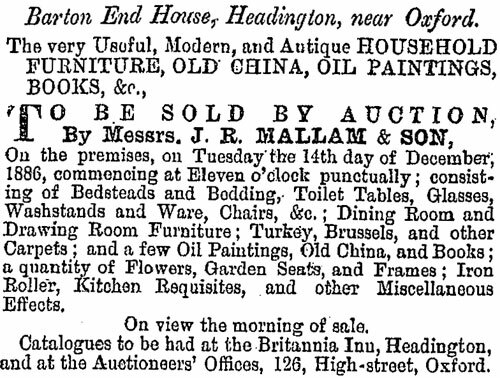 By the time of the 1891 census the house was occupied by the florist Charles Jacob, his wife Ellen, and son Jacob. The next occupant was the Revd. Charles T. Gillett (listed there only in the 1893 directory), followed swiftly by H. Stafford T. Biscoe from 1894 to 1895, and a Mrs Monro in 1898. The Revd Henry Spencer Kenrick Bellairs, University Reader of Marathi and a clerk in holy orders (despite only achieving a Fourth in Law & Modern History in 1863 after studying at Pembroke College, Oxford) was the next occupant, and can be found in the house in the 1901 census, aged 60, with his wife, his three daughters aged 23, 26, and 27, and two servants. He continued to be listed at Barton End in directories to 1907. From 1909 to 1919 the house was occupied by Mrs Gregory Way. The 1911 census shows Ada Louisa Way (58), who described herself as both the head of the household and as having been married for 22 years. She was childless, and lived at Barton End with three servants. From 1921 to 1923 Major Richard Rouse Sydenham Rowell lived at Barton End. The next occupant, Horace Joseph Bradley, JP, lived in the house from 1925 to 1945. He was a well-known businessman in Oxford, owning the Cadena Café, Weeks' Bakery, and the George Restaurant. He contributed greatly to the Headington community during his lifetime: in 1935, for instance, he gave a Silver Jubilee party in his house and garden for all the residents of Barton village and Barton Road. His lasting legacy was to donate the land of the former nursery opposite Barton End to be used as an amateur sports ground by Headington cricket club, which was being squeezed out of the Manor Ground by Headington United Football Club (of which he had been a director). Bradley died at Barton End at the age of 77. His funeral was at St Andrew's Church on 29 December 1945, and he was one of the first Headington people to be cremated. Barton End was then taken over by Oxford City Council Welfare Services Committee as “Part III accommodation” for elderly people. In 1992 permission was granted for the house to be converted to five flats, and for 25 houses and six flats to be built in its garden: these are called the Sycamores and the Beeches.